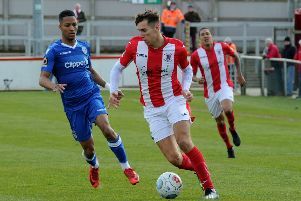 The Banbury United boss saw his players carry out their instructions to the letter in Saturday’s victory against the Evo-Stik League South promotion-chasers. Ford said: “We have a plan every week, sometimes it doesn’t work if the players don’t follow it through or the opposition are that much better. But we did everything I wanted us to do and the players were totally disciplined for the entire 90 minutes on Saturday. “It was no use trying to go toe-to-toe with King’s Lynn, we had to set up to be harder to beat. The players have bought into what we’ve been trying to do in the last few games. “From start to finish, the way the players went about their businesses was very professional because you could see what King’s Lynn brought to the table. They are a very experienced team, big, strong and good on the ball so there was no point in us trying to chase the game. From 1-16, all the players contributed, even those who didn’t get on.